Thrash legends Exodus had a blast opening for Megadeth and Testament earlier this year, but now it's time for the Bay Area bashers to step out from the sidelines and launch their own headline tour, which should be nothing short of a 'March of Brutality' -- at least that's what they're calling it. Adding to the brutality will be openers Malevolent Creation, Holy Grail and Bonded by Blood (who took their name from Exodus 1985 debut album). 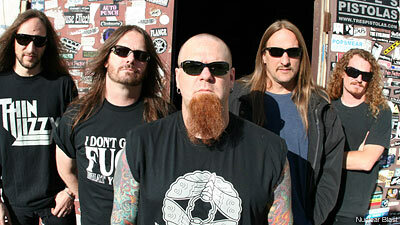 "We are f---ing stoked," said guitarist Gary Holt. "This tour is going to re-write the book on how much fun is actually legal." Exodus will be supporting their latest album -- 'Exhibit B: The Human Condition,' which came out May 18 -- on the March of Brutality Tour.